Hervé TEMIME set himself up in 1979 as a lawyer specialising in criminal law. His expertise in this field was quickly recognised and enabled him to become a key figure of the Bar as a result of the major criminal proceedings in which he served as counsel before the cour d’assises [criminal court].At the end of the 1980s, due to this thorough knowledge of general criminal law and the mastering of financial tools, he also gained recognition as a leading lawyer in the field of criminal business law at a time when criminal proceedings for financial offences were on the rise, before expanding his activity to litigation.This triple expertise in general criminal law, criminal business law and litigation today enables the firm to propose a unique offer to its clientele in criminal defence matters and business litigation. It is based on a complementary professional approach, in particular due to know-how in the mastering of procedural issues and the running of hearings, and experience of high-stakes personal, financial or media files. In line with this complementary approach, Hervé TEMIME decided to gradually, since 2008, build a lawfirm with his best associates specialised in criminal defence and litigation in all its forms. Thanks to an astute approach to the most complex legal situations, the firm provides its clients, whether individuals or legal entities, with tailor-made advice and guidance in respect of general criminal law, criminal business law and litigation. 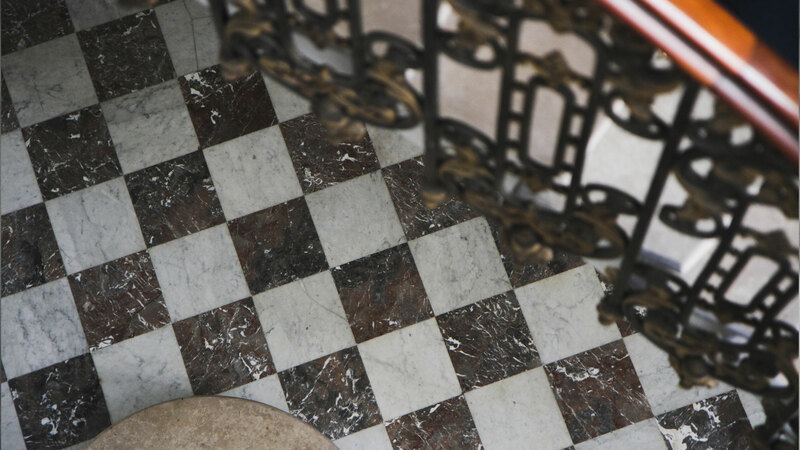 Benefiting from the diversity of the expertise and experience of its partners, the firm acts before all criminal, civil and commercial courts in France. It has also developed particular expertise in international matters. 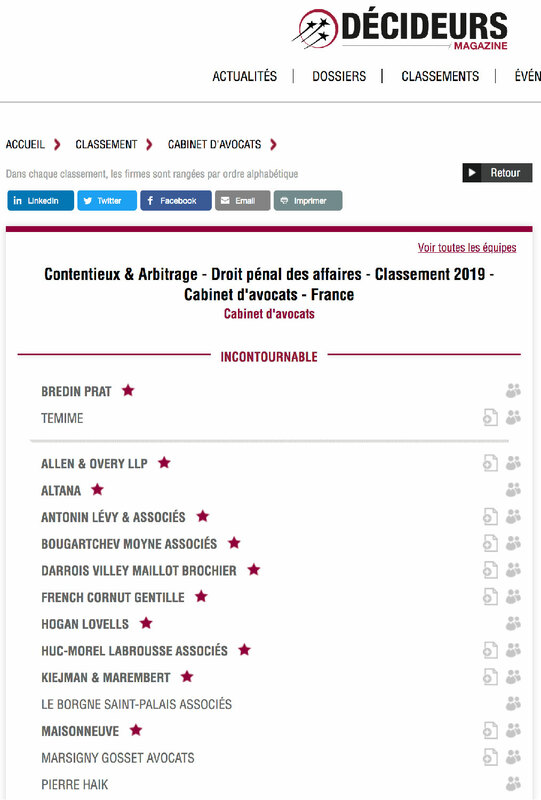 The firm’s excellence has been officially recognised on numerous occasions: rankings by Chambers and Partners, in the Legal 500 and in the magazine Décideurs (Leaders League), Who’s Who Legal, etc. 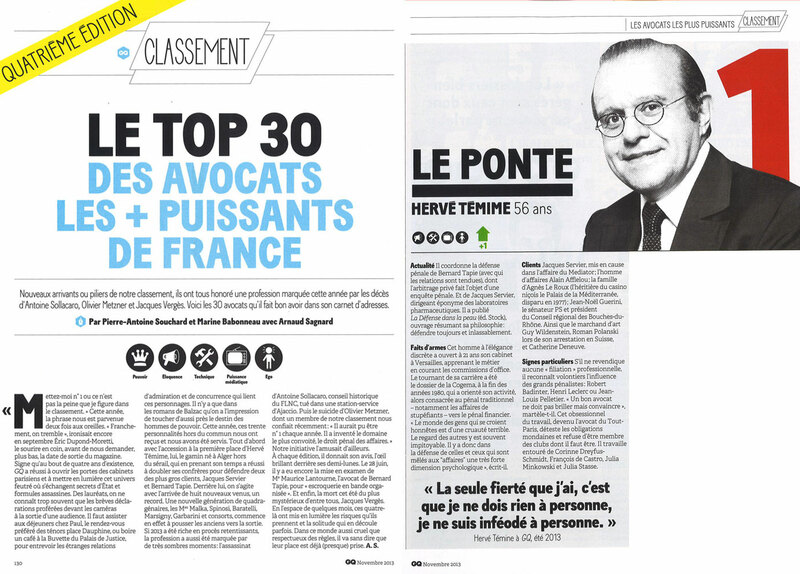 In 2018, TEMIME won the « Best Specialized Team – White Collar Crime » award at the Trophées du Droit ceremony, and Hervé TEMIME was named « Lawyer of the year » (criminal defense) by Best Lawyers. 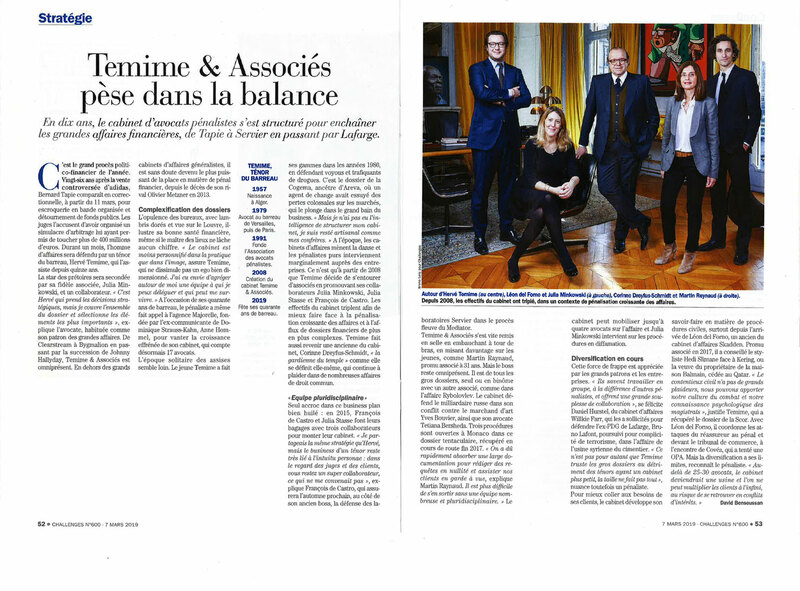 In 2019, TEMIME received another award at the Trophées du Droit ceremony in the « White Collar Crime » category, and the Firm’s leadership was acknowledged by several French major business newspapers (Les Echos, Challenges). In a society that is ever more litigious and in the glare of the media, anyone can one day end up having to go to court. Faced with the increasing complexity of the regulatory environment, our role as lawyers of being able to defend anyone involved in legal proceedings in a manner that is both effective and humane. Thanks to a close-knit team of criminal defence and litigation lawyers, TEMIME devises its assistance as a complete, tailor-made offer, suited to each of its clients, changing over time in the course of proceedings. Benefiting from historical expertise in general criminal law, thereby having a thorough knowledge of hearings and of the administrative workings, Temime is committed to making its top-of-the range expertise available to everyone, in the tradition of criminal defence. TEMIME’s lawyers, recognised experts in the field of criminal defence and litigation, share the same independence and the same sense of ethics, two essential forces when it comes to handling high-stakes personal, financial or media matters. TEMIME is committed to providing its clients with advice based on stringency, transparency and availability. 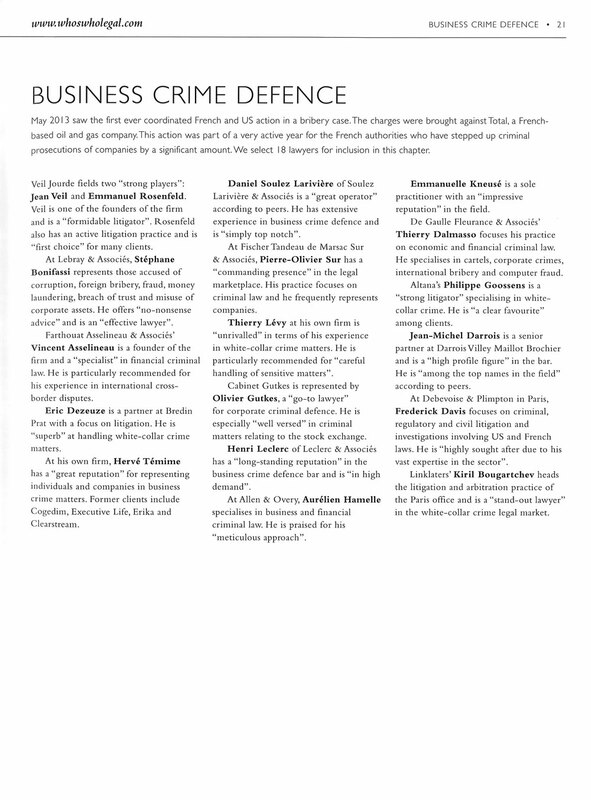 The goal of TEMIME’s lawyers is to offer assistance and a rigorous and effective defence including the prevention of criminal risks in companies, hearing preparation (with concrete simulations), management of criminal and litigation proceedings, and pleading, with a distinctive experience in sensitive and/or high media exposure matters. · criminal business law: misappropriation of company assets, breach of trust, laundering, corruption, influence peddling, illegal undeclared conflict of interest, tax fraud, stock market offences, infringement, cybercrime, etc. The firm also defends its clients facing justice abroad. TEMIME defends its clients involved in legal proceedings abroad or suspected of having committed a criminal offence abroad. It has developed a series of partnerships with the finest independent lawyers specialised in criminal defence in Europe, the United States and Africa. TEMIME also works with his clients facing litigation abroad at the occasion of their commercial and financial activities. Temime, an independent firm set up by Hervé TEMIME, is a group of lawyers specialised in criminal defence and litigation, whose success lies in its expertise, experience and a particular sense of commitment. The entrepreneurial approach of this firm guarantees its clients personalised guidance and a precise understanding of their legal problems. The firm is reactive and creative as a result of the diversity of the backgrounds and complementary nature of the personalities of the lawyers comprising the team. Engrained in the traditional culture of criminal law, TEMIME brings to its clients undisputable skills in general criminal law, as well as an unrivaled professional approach of business criminal law and litigation, thanks to the experience of its partners, familiar with proceedings and hearings with high-stakes personal or financial issues, which is linked to a specific recruitment of associates coming from criminal defence firms and international business lawfirms. Tailor-made advice, ability to anticipate, permanent adaptation, long-term commitment and exactitude forge TEMIME’s hallmark and culture. It is this same hallmark which has made Temime one of the most recognised firms in the field of criminal defence. 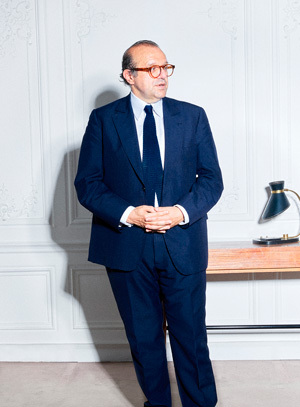 A lawyer since 1979, Hervé TEMIME set his firm as soon as he was registered to the bar. Founder of the TEMIME firm, he very quickly gained an illustrious reputation in numerous proceedings before the Assize Court (the court which hears criminal cases). For many years he has been recognised as a specialist in the criminal defence of individuals and legal entities, in the fields of both general criminal law and criminal business law. He has defended individuals involved in numerous sensitive matters, as well as litigation proceedings with high-stakes issues. He has also defended fellow lawyers before judicial and professional bodies. 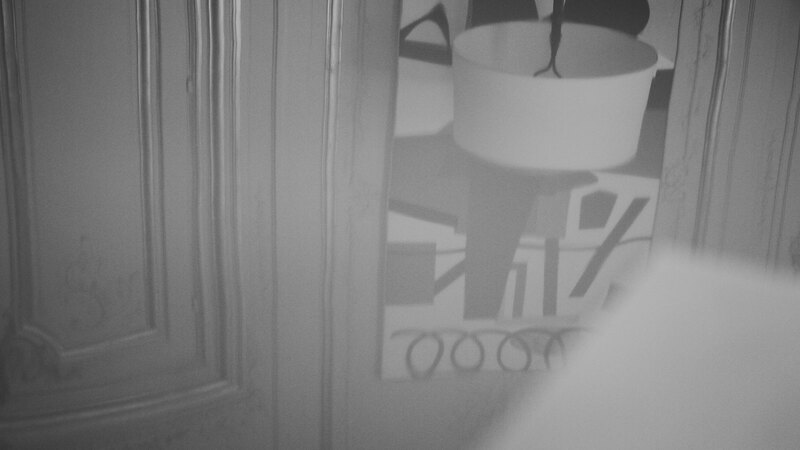 He is the author of La défense dans la peau (Stock, 2012). Hervé TEMIME has also carried out various functions connected to his legal activity. He was the Premier Secrétaire de la Conférence du Stage [Laureate of a competition of young lawyers] of the Versailles Bar in 1980. In 1991 he founded the Association Des Avocats Pénalistes [Association of Lawyers Specialised in Criminal Defence] (of which he is still Honorary President) and was formerly a member of the Conseil de l’Ordre [Bar Council] (AMCO) between 1999 and 2002. 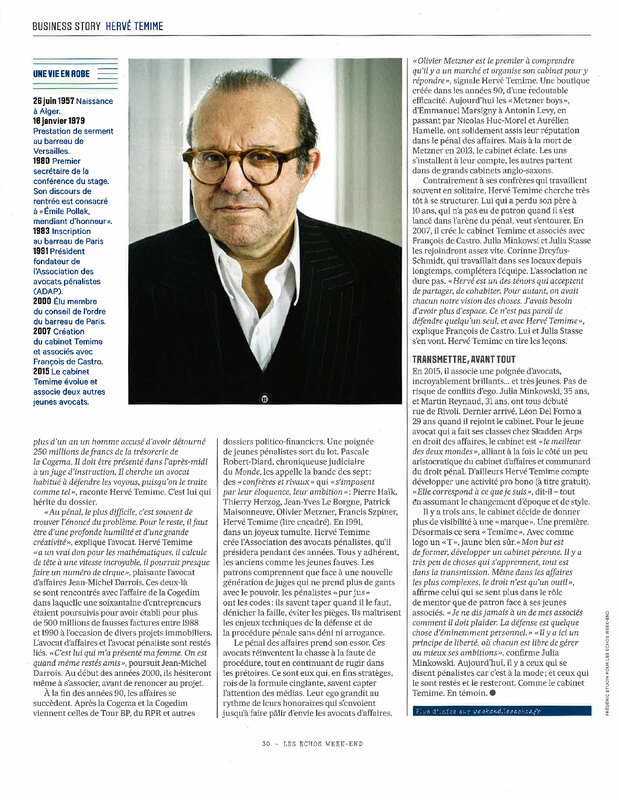 Read Hervé TEMIME’s portrait in the Challenges. 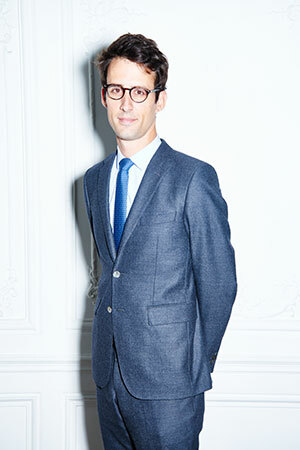 Read Hervé TEMIME’s presentation by GQ Magazine (1st place of 2013 ranking). 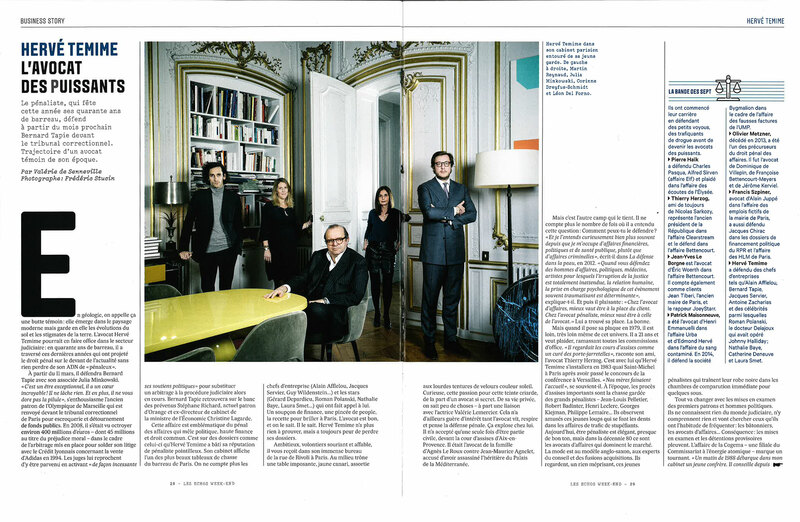 Listen to Hervé TEMIME’s interview on France Inter radio on 17th October 2015. 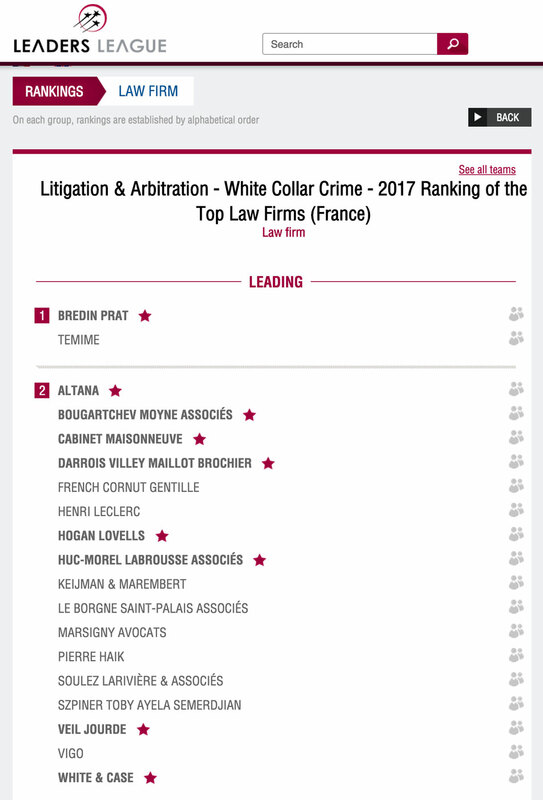 Read Hervé TEMIME’s presentation by Décideurs (Leaders League) (joint 1st place of the 2017 ranking – category : White Collar Crime). Listen to Hervé TEMIME’s interviews on France Culture radio in January 2019. 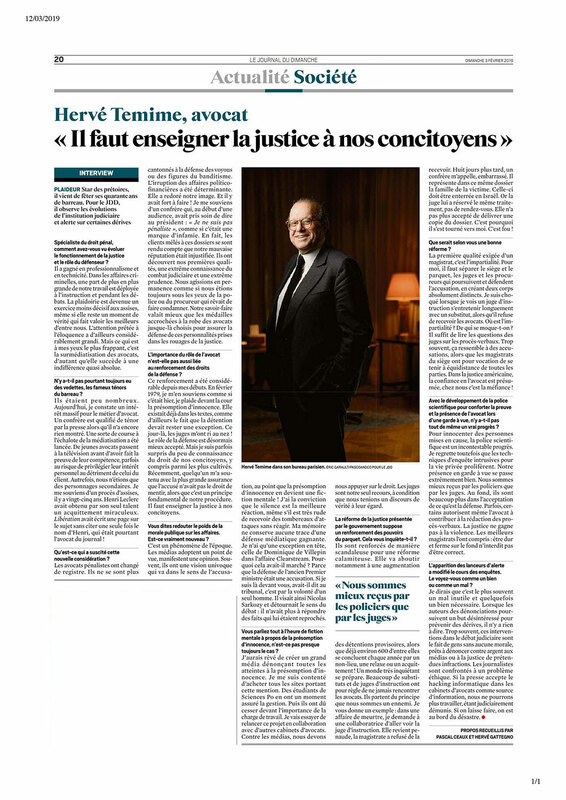 Read Hervé TEMIME’s interview by Le Journal Du Dimanche on 3rd February 2019. Corinne Dreyfus-Schmidt decided to become a lawyer specialised in criminal defence in 1989 thanks to Henri LECLERC. 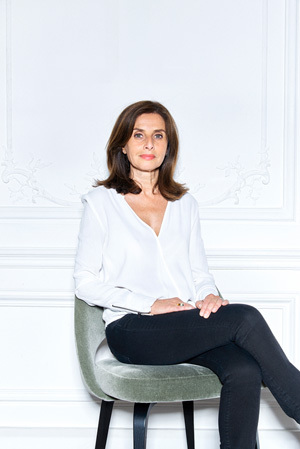 She began her carrier with Hervé TEMIME and.then she founded her own firm in 1993 in the same office as Hervé TEMIME. She thereafter became a partner in the TEMIME firm. Specialised in general criminal law and seasoned in criminal business law, she litigates on a regular basis before criminal courts and Assize Court (the court which hears criminal cases) all over France and also abroad, in particular in Africa. She also acts before various professional and disciplinary bodies, in particular in the area of sports law. Corinne Dreyfus-Schmidt teaches criminal law and procedure before the Assize Court (the court which hears criminal cases) at the Ecole de Formation du Barreau [Bar training school] and at the Ecole Nationale de la Magistrature [national school for the training of judges]. She was elected Vice-President of the Union des Pénalistes Européens [european association of lawyers specialised in criminal defence] in February 2016. 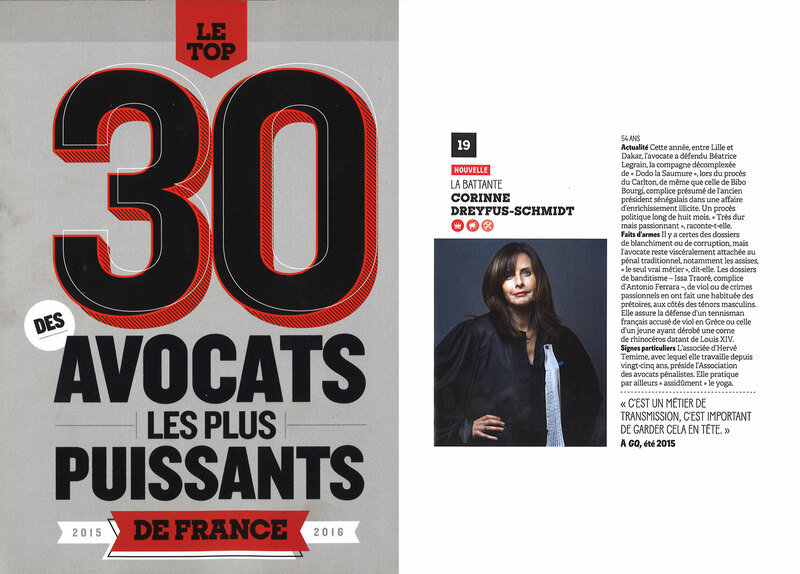 She was President of the Association Des Avocats Pénalistes [french association of lawyers specialised in criminal defence] from 2008 to 2016 ; she is now membre of the board of this association. She takes part in the study of legal developments with the law commissions of Parliament and, as such, has become a leading participant in colloquia on criminal defence. 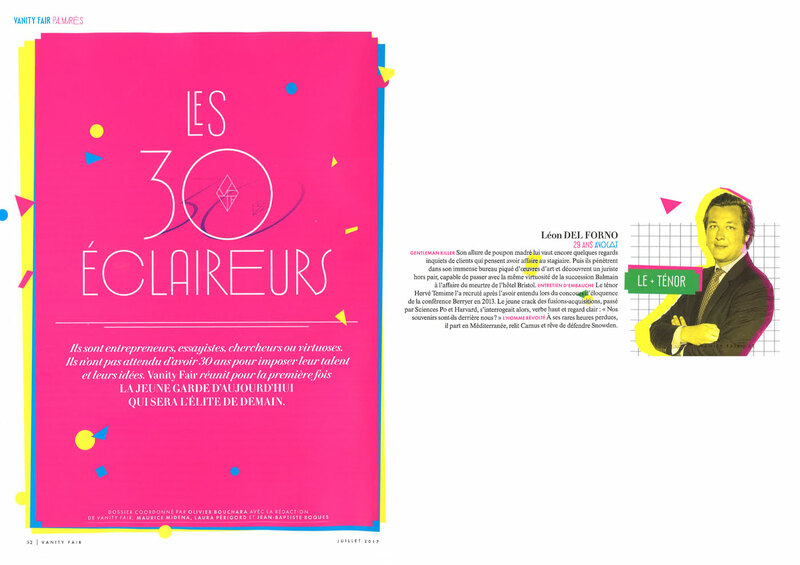 Read Corinne DREYFUS-SCHMIDT’s presentation by GQ Magazine (2015 ranking). Julia Minkowski was admitted to the Paris Bar in 2006 when she joined Hervé TEMIME, before becoming a partner of TEMIME. She mainly acts in business criminal law, general criminal law and business litigation, as well as in press law and art market matters. She has developed an in-depth mastery of international cases, in particular those in English-speaking countries. Julia Minkowski holds a Master’s degree in Business Law and a DEA [postgraduate diploma] in General Private Law from the University of Paris II Panthéon-Assas. She is also a graduate of the Institut d’Etudes Politiques de Paris (Sciences-Po) and completed part of her studies on an exchange programme with the University of Columbia in New York. She was selected by the French-American Foundation as one of the twenty French and American people aged 30 to 40 years old called on to play a major role in cooperation between France and the United States: the “Young Leaders”. She teaches at the Institut d’Etudes Politiques de Paris (Sciences-Po). Listen to the speech of Julia MINKOWSKI on Europe 1 radio on 4th June 2017. Martin Reynaud is a partner at TEMIME. 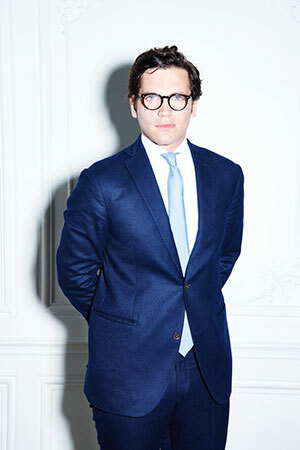 He graduated in 2006 from the Institut d’Etudes Politiques de Paris (Sciences-Po). He continued his studies at the University of Paris I Panthéon-Sorbonne, with degrees in general private law, and criminal and criminal policy law gained in 2008. He has been admitted to the Paris Bar since 2010, when he joined TEMIME. Martin Reynaud acts principally in matters of general criminal law, criminal business law and press law. He was in 2011 elected Secrétaire de la Conférence des avocats du Barreau de Paris, a two-uhundred-year-old institution which each year, by means of a public speaking competition, elects 12 lawyers in order for them to be court-appointed before the cour d’assises [criminal court] in the most complex and serious matters. He teaches criminal procedure at the Ecole de Formation du Barreau [Bar training school] and works with graduate students specializing in criminal law at the University of Paris Sud. 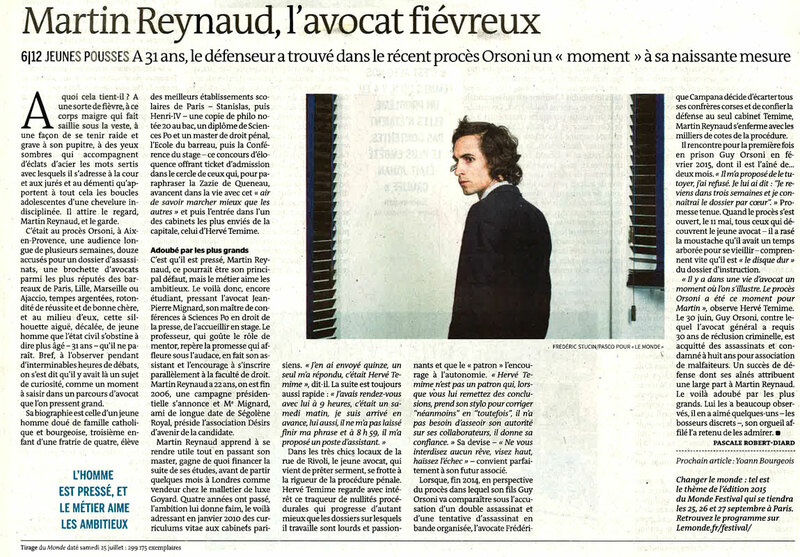 Read Martin REYNAUD’s portrait in the newspaper Le Monde. Léon DEL FORNO is admitted to the Paris and New York Bars. He began his career in the american law firm SKADDEN ARPS, where he practiced corporate law (M&A), from 2011 through 2015, when he joined TEMIME, before becoming a partner. His practice mainly focuses on white-collar crime, criminal law, and business law (corporate advice and business litigation). 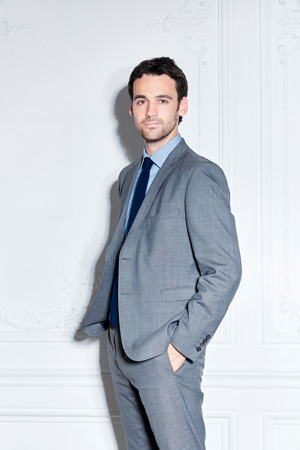 Léon DEL FORNO holds a Master in Economic Law from the Institut d’Etudes Politiques de Paris (Sciences-Po), a Master in Business Law from the University of Paris I Panthéon-Sorbonne, as well as a Master of Laws (LL.M.) from the Harvard Law School. 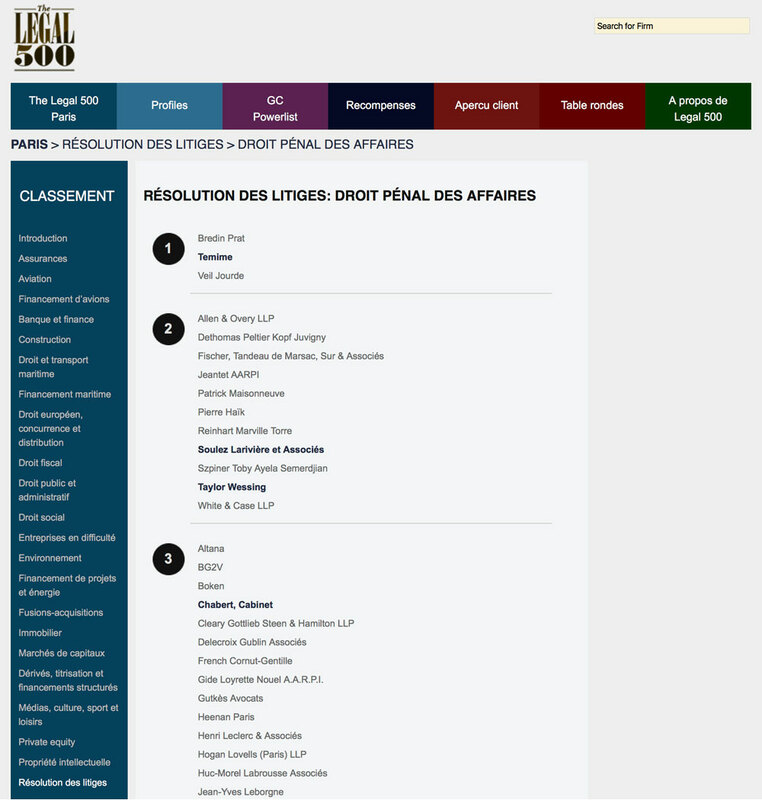 In 2014, he was elected Secrétaire de la Conférence des Avocats du Barreau de Paris, a two-hundred-year-old institution which each year, by means of a debating competition, elects 12 lawyers in order for them to be court-appointed in the most complex and serious criminal matters. 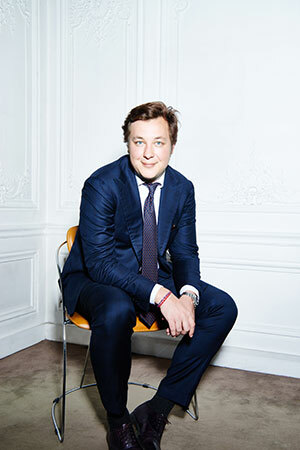 Read Léon DEL FORNO’s presentation by Vanity Fair. 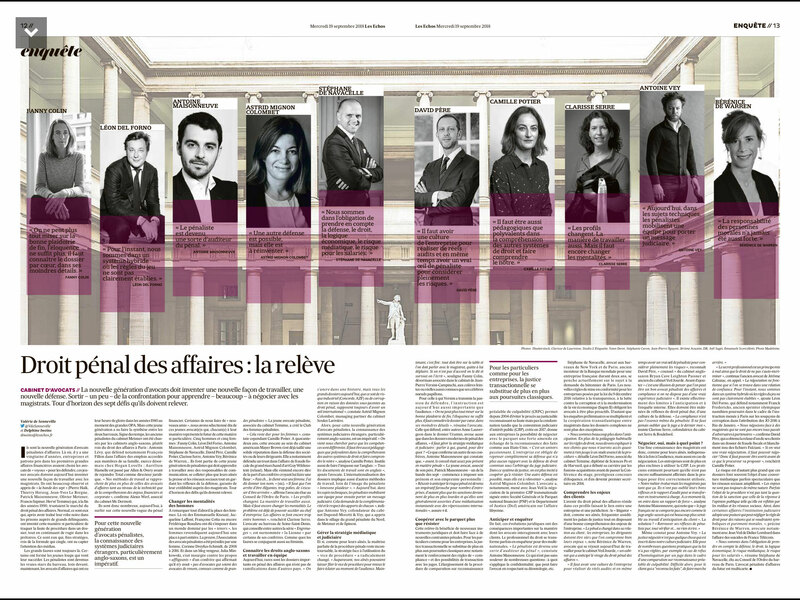 Read the article « Droit pénal des affaires : la relève » published in the newspaper Les Echos in 2018. 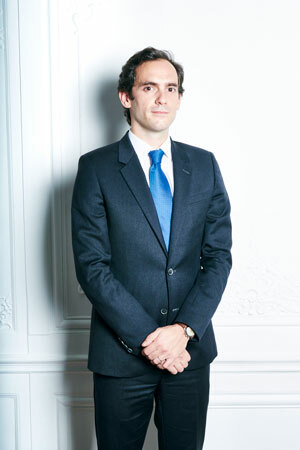 A lawyer since 2011, he holds a Master's degree in Business Law gained from the University of Paris II Panthéon-Assas in 2007, as well as a Corporate Lawyer Master's degree gained from the University of Paris V Descartes in 2008. Specialised in criminal business law and criminal health law, Harold Teboul also takes part in the commercial litigation cases of the firm. He speaks English. Former President of the GENEPI (Groupement d’Etudiants National d’Enseignement au Personnes Incarcérées) [the national grouping of students working to break down social barriers for those in prison], and member of the French section of the OIP [International Observatory of Prisons], she is specialised in general criminal law and criminal business law. She holds a Master's degree in Legal and Judicial Careers that she gained from the Institut d’Etudes Politiques de Paris (Sciences-Po) in 2011. She speaks English and Persian fluently. Yoan Havard is specialised in civil and commercial litigation and criminal business law. He holds an LLM from the Queen Mary and Westfield College of the University of London which he gained in 2010 after a Master's degree in International Business Law and a double Master’s degree in English law from the University College London. He speaks English fluently. 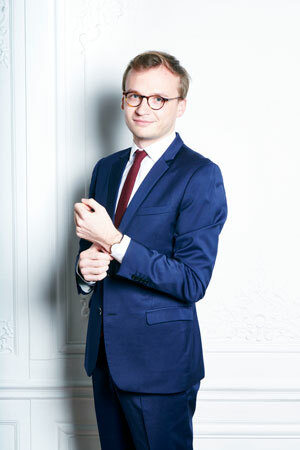 Member of the Paris Bar since 2012, Quentin de MARGERIE is a graduate from ESSEC Business School. He holds a Master’s degree in litigation, arbitration and alternative dispute resolution modes from the University of Paris II Panthéon-Assas. After four years of practicing litigation and arbitration in a major American law firm, he joined TEMIME, where he focuses on criminal business law, commercial and civil litigation and arbitration. He speaks English fluently. 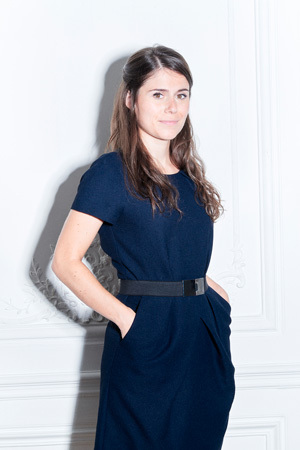 Anastasia CHRISTIN graduated in 2013 from Institut d’Etudes Politiques of Paris (Sciences-Po). She continued her studies at the University of Paris II Panthéon-Assas where she gained a Master’s degree in business Law. After a first experience in the American business law firm LATHAM AND WATKINS, she is now specialised in commercial and civil litigation, criminal business law and general criminal law. She speaks English fluently. Benjamin BOHBOT’s professional practice has a strong focus on criminal law and white-collar crime. He holds a Master’s degree in Criminal Law and Criminal Sciences from the University of Paris II Panthéon-Assas (valedictorian of the class of 2014). He has taught Criminal Law and Criminal Proceedings (TA of Professor CONTE) and interned with the Public Prosecutor’s office in Paris (organized crime section). He speaks English. 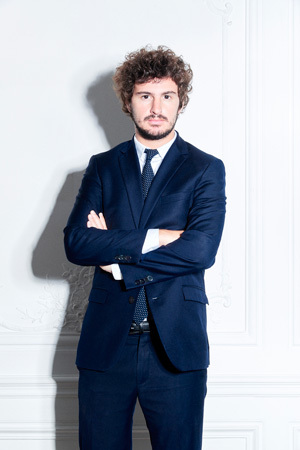 Balthazar LEVY graduated in International Law at Panthéon-Assas Paris II University in 2015, since then he has obtained an L.L.M. and Master’s degree in Comparative and European Private International Law from Dundee University and Toulouse Capitole I University. Since his experience at Thierry Lévy et Associés law firm he has specialised in Criminal Law and Criminal Business Law. He speaks English fluently. Admitted to the New York State Bar, Vincent DESRY holds a Master in Economic Law from the Institut d’Etudes Politiques de Paris (Sciences-Po), with a concentration in Economic and Business Litigation and Arbitration, and a Master of Laws (LL.M.) from the New York University School of Law. Before joining the Firm, he interned at Allen & Overy and Dupond-Moretti & Vey. He is a member of the American Civil Liberties Union (A.C.L.U.). He speaks English fluently. 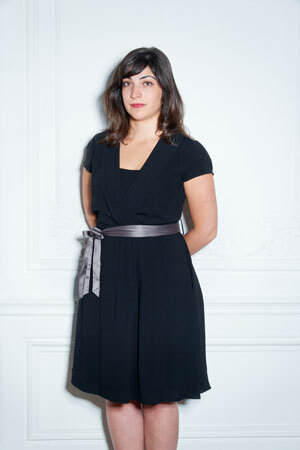 Former student of the École Normale Supérieure (Cachan), Gwennhaëlle BARRAL graduated in 2015 from Institut d’Etudes Politiques of Paris (Sciences-Po). She continued her studies at the University of Paris I Panthéon-Sorbonne, where she gained a Master’s degree in general private Law. After a first experience with VIGUIE SCHMIDT & ASSOCIES, she now specializes in commercial and civil litigation, criminal business law and general criminal law. She speaks English fluently. Julie TIBERI specialized in general criminal law and criminal business law after she graduated her Master’s degree in Economic Law from the Institut d’Etudes Politiques de Paris (Sciences-Po). Former member of the GENEPI (the national student association for the social reintegration of inmates), she interned with the Public Prosecutor’s Office, working at the Criminal Court of Paris. She speaks English and Spanish fluently.